Once in a while, we like to get the party started all on our own. We turned one and celebrated it the way we knew best - with an art market! Taking over Deck, a gallery space made from stacked shipping containers, we brought in friends old and new. We got Band of Doodlers and All Aflutter to do a custom photo booth, which required a group of 10 doodlers and 3 hours to complete. Edwin Koo's captivating snaps of passengers on the train (from the series titled We Are Commuters) were blown up to cover the sides of the containers for a life-sized exhibition. Most of the time, we get approached by organisations to come up with relevant and fresh ways to meet their various objectives, and we make sure we have fun doing it. The first partnership was for the Singapore Night Festival 2014, a weekend of art and performances within the Bras Basah precinct. We teamed up with one of Singapore's leading contemporary art museum, SAM, to line Queen St with 100 different art, food and retail vendors and treated visitors to live music and DJ sets. In a bid to raise awaresness for protate cancer, we worked with Movember, the non-profit organisation that has spawned an international following where men grow out their facial hair till November when they shave it off. For this, we turned the roof top of the car park into a breezy hangout with great food, music and activities (such as a barber and the Best Moustache contest). the local people x DBS Paylah! A heavy downpour didn't damp our spirits for this one as we, and to our surprise many others, stomped around in the mud. A joint effort to promote the use of cashless payment DBS Paylah! by DBS Bank Ltd, the art market saw musicians perform under the stars when the sky finally cleared up. 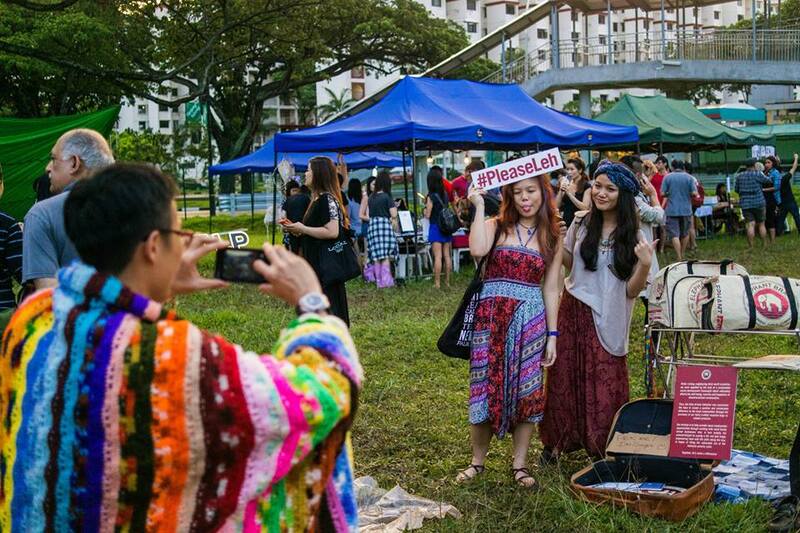 Most of the makers at TLP art markets hold full time jobs so, together with NTUC PMEs, we wanted to encourage more people to be creative and open, say, pick up a second skill. This was held at the newly opened co-working space, Working Capitol, where we were even visited by a pet dog. The annual Aliwal Night Arts Crawl is an initiative by the Aliwal Arts Centre to promote and raise awareness of Singaporean art within the Kampong Glam precinct. We were called in to shake up the car park close by with an art market. Best part: we had front row seats to the stage performances of traditional Malay drums and contemporary dance. A showcase of NOISE Singapore, a government organisation created to support youths in the arts, the TLP art market was held alongside the main stage. It was on Halloween Night so we had to have a face-painting booth. Our first art market held in the daytime was at SAM as part of Art Week, a seven-day affair involving most of the museums in the country. We packed in over 100 makers within the inner courtyard and the Glass Hall for a full day of shopping and eating. Of course, we didn't skip the music either. 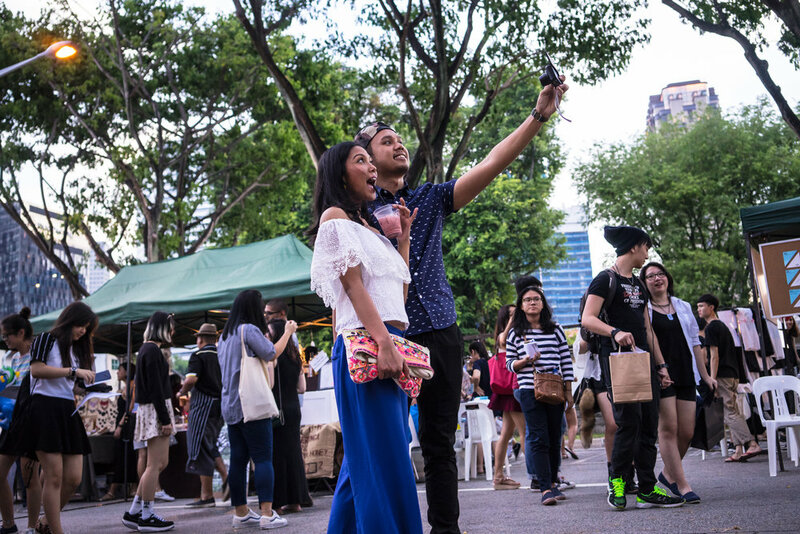 Called HUART, a play on the colloquial term 'huat' meaning prosperity, we rung in the Lunar New Year at Chinatown with a cosy art market and movie screenings on the walls of the Sri Mariamman Temple. On the playlist were Already Famous by Huat Films, Tony's Long March and The Obs: A Singapore Story. Our biggest turnout to date - more than 33,000 people - was the most the disused train station saw come through its rusted gates since the termination of the train service from Singapore to Malaysia. Within the walls of the station was a plush beanbag seating area for movie screenings and a food donation drive for Food From The Heart, while on the platforms were two lines of food, retail and art stalls. We were called in to boost awareness for Enabling Village - a hub of sorts containing a school for people with special needs, a cafe, a gym and supermarket created to help them integrate better into society. The car park turned into an art market for the night and we got Band of Doodlers to draw on the art wall that was also used for a movie screening. Organised by DBS Bank, the annual rowing competition DBS Marina Regatta once again transformed the Promontory into a man-made beach, complete with the largest inflatable water slide. We curated makers for the retail containers that ran from the beach to the slide, and the entire food village where we proudly showcased local restaurants/eateries. Themed 'Never Growing Up', this collaboration with National Heritage Board reminded us (and visitors) why it's important to keep a childlike curiosity about you. We used the Waterloo Art Space to hold a picnic seating area where music performances, storytelling and movie screenings took place. New Balance Run On took a more lifestyle approach for the year's marathon, for which they wanted an art market during their race pack collection weekend. Can't say we became sportier after, though. We kicked off 2017 with a crazy idea: hold an art market under a highway. Named the 'Duct Tape Party', we invited Kerbside Gourmet food truck in addition to a handful of stalls, set up a long communal dining table, and a horizontal seating area to watch films as we projected them on the underside of the viaduct.